Prior to coming to Sydney, I have kindly asked mum if she could make some of my favourite Indonesian dishes, one being sate ayam! You can never get good sate ayam unless I go back to Indonesia or at mums. So one weekend, we organized a get together with friends and family and mum made some of our favourite meals including sate ayam, beef rendang, wontons, spring rolls, bakso goreng and nasi kunning! Let’s start with the sate ayam, chicken sate. 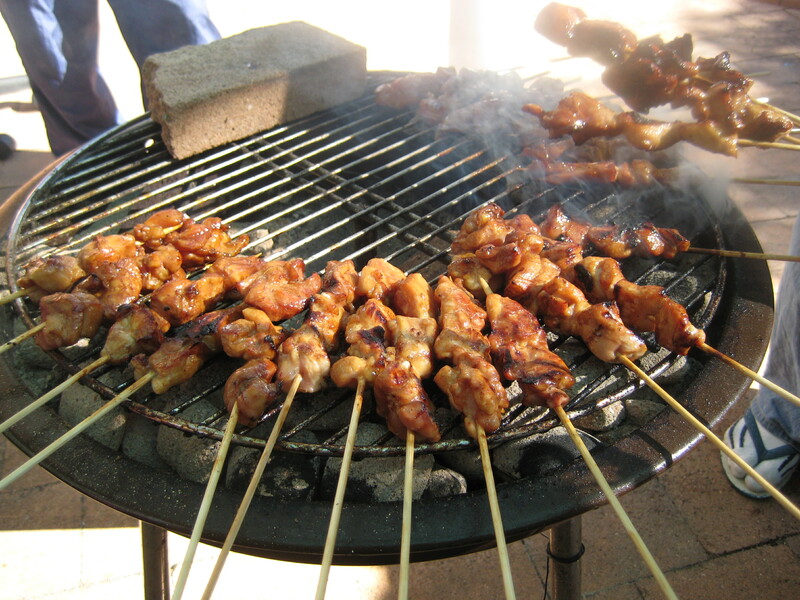 Mum and dad specifically made these the night before, well, they put all the chicken on the stick and on the day we put them on the bbq with charcoal so you get that charcoal smelling flavour. The chicken sate was tender, succulent and absolutely fantastic! It truly did hit the spot! Dad made about 140 sates, I know for a fact, that my friend J, ate 18 sticks! My brother, F, ate about the same, I think I only ate 10! Disappointing but I was seriously stuffed! 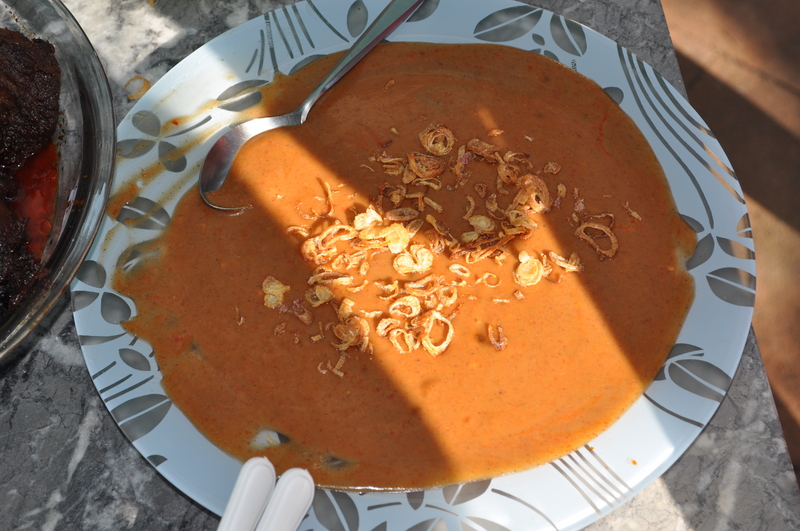 The peanut sauce accompanied with the sate ayam was delicious! Nasi kuning – Indonesian rich dish, rice cooked with coconut milk and turmeric. 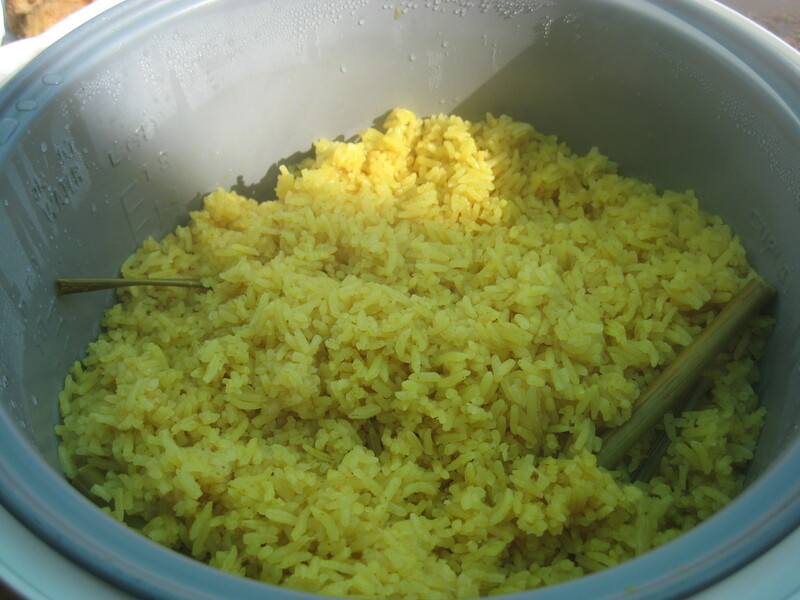 I love mum’s nasi kuning – I have tried making this dish but every single time, FAIL! She has given me the recipe and I have tried but something is always missing. The nasi kuning was full of flavour and the aroma…. Absolutely fantastic! 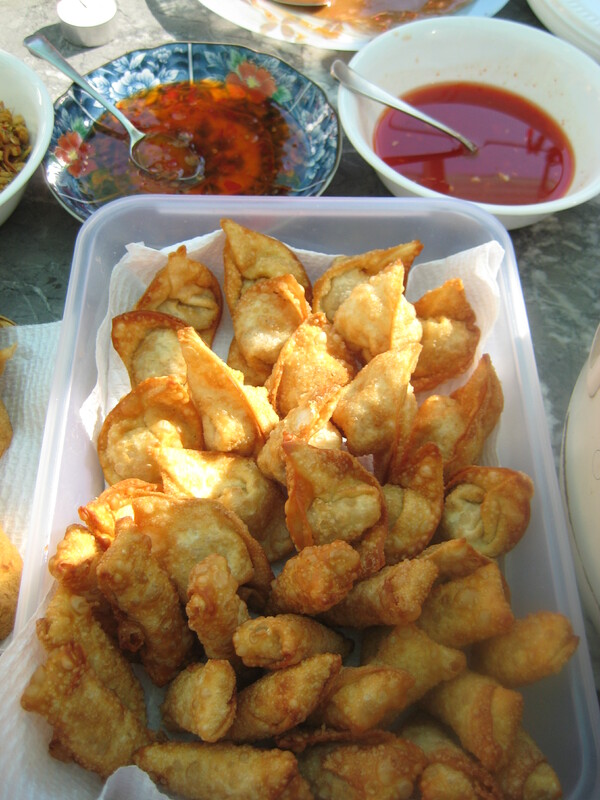 Deep fried wontons and spring rolls, I didn’t have too many of these, I really wanted to leave room for all the other fantastic dishes. 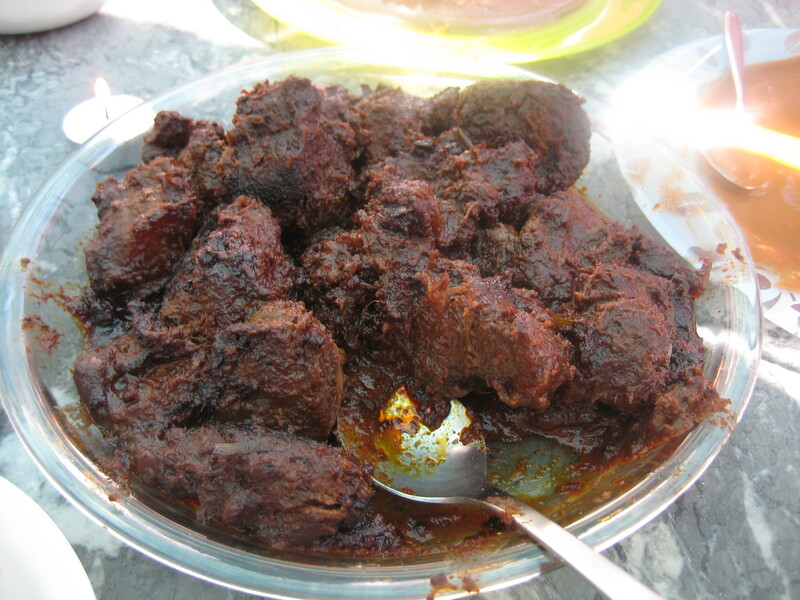 Mum’s famous beef rendang – she definitely made this with lots and lots of love! It was just wonderful! I know how long it takes to make the beef rendang, it was incredibly tender, full of flavour and had a hint of chili which was just fantastic! No one does beef rendang like mum that’s for sure! Bakso goreng, deep fried pork balls. We bought these, the day before from an Indonesian restaurant in Kingsford, Pinanggsia. I absolutely love their bakso goreng. 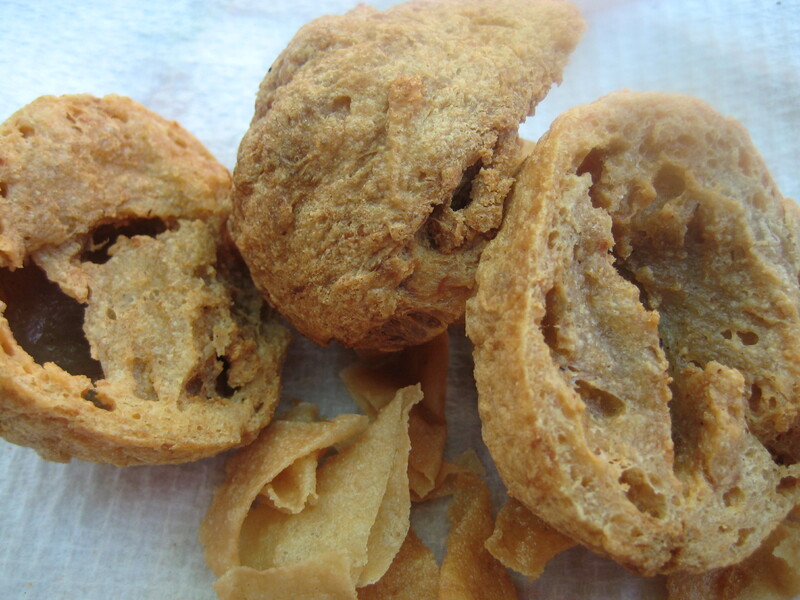 Mum was going to make her special bakso goreng but ran out of time, so bought some – which was just as good! They were HUGE, hence she cut them in halves. And who can forget all the condiments that goes with the food? 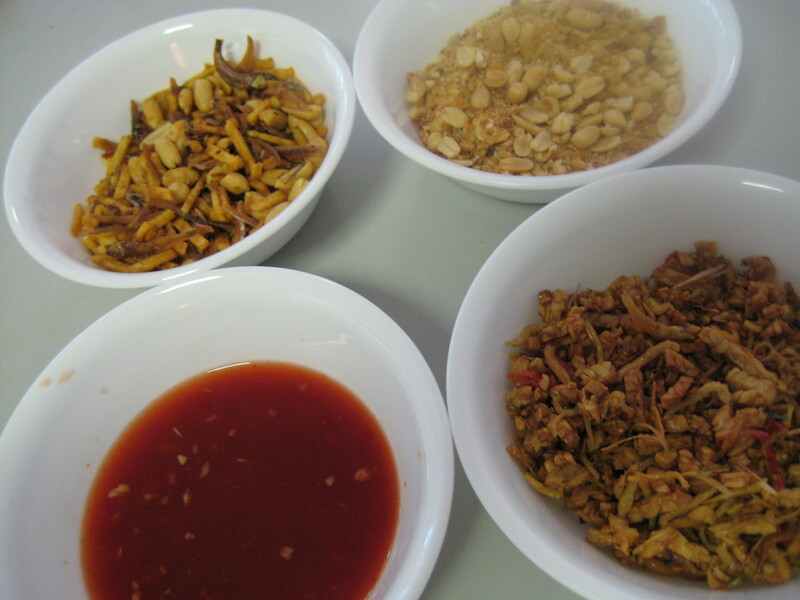 Two types of Sambal goreng; sambal goreng with tempeh, sambal goreng with fried fish, and coconut with peanuts. All can be eaten on its own or with the nasi kunning. We had dessert – it wasn’t your typical Indonesian dessert, but still it was good. 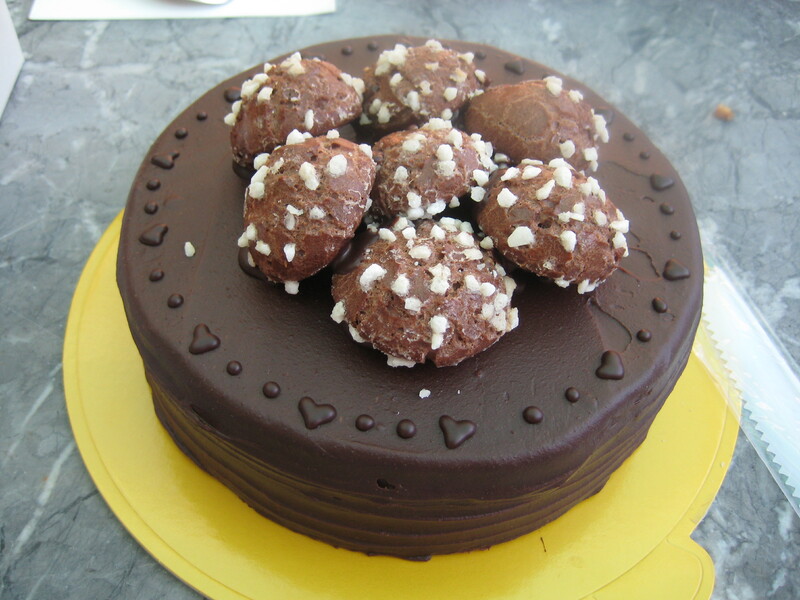 Chocolate mud cake, J and N bought this and I have to say, it was fantastic! It was light and rich, but not sickly rich. It was a perfect way to end the meal. The Indonesian feast was just phenomenal, it was exactly what I wanted and craved for. It truly hit the spot! I could have eaten the sate and rendang with nasi kuning day in and day out! I really do miss the family / friends get together! 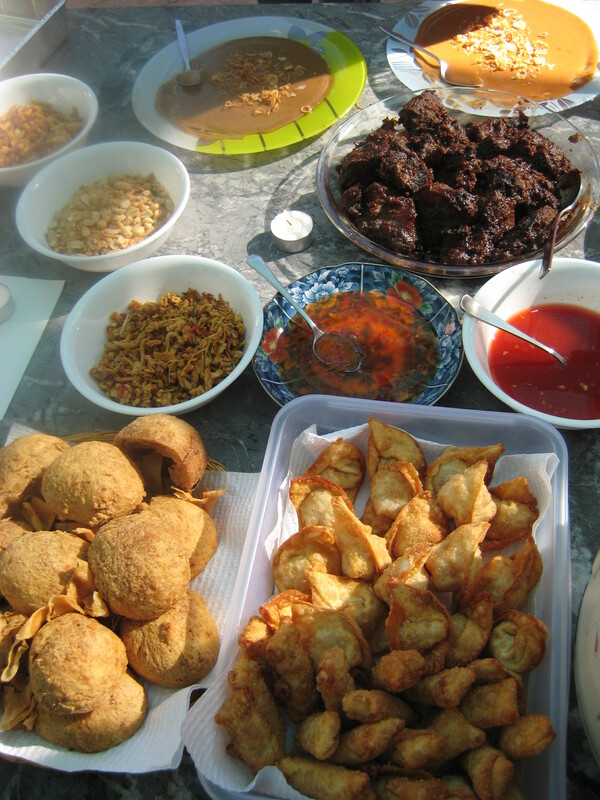 A cracker of a meal… satay, the nasi kuning, the rendang… wow!! put on 1kg after that feast, and did not need to eat dinner haha or brekkie the next day infact. thanks mum the best!!!!! !